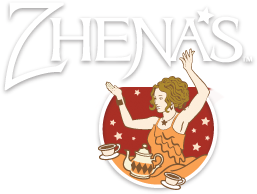 Zhena's offers all natural and organic healthy infusions. Their methods began long, long ago with the tea blending principles of monks and herbalists. They brought those ideas into the current with the latest health research. The product is hand-crafted, premium quality and the only tea which can claim 100% organic and 100% Fair Trade certified. The web site is attractive and easy to navigate and the teas? Ahhh..exquisite! The company began when Zhena's son, Sage, was born with a severe birth defect. A lack of funds and insurance would crush most of us. However, Zhena took on a fighting stance and drew upon her Ukrainian gypsy ancestry when she began peddling her teas out of a cart on California street corners. Zhena took tragedy and made something beautiful out of it. Today, Sage is energetic and well. The brand has won many awards, a book has been published and The Robin Hood Laptop Project was born too. It's a great story. It's a great product. It's an excellent way to acknowledge Hot Tea Month.